Emails and visitors nagged us repeatedly for a wherry to fill the niche between our Duck Trap Wherry and Newfoundland Trap Skiff. They wanted a boat that would be in the 15' range and be able to sail as well as row. Additionally, we wanted enough beam to make her stand up under a good press of sail. Factor in that she needed to be a shoal draft centerboarder with minimum freeboard and enough weight to avert any corkiness afloat, have a capacity of 2-3 (or 4 in a pinch), and a sail rig that stows completely within the boat. That's a taller order than you might think, and the reason it took two years to fully develop her design. And yes, she can be outboard powered. The Christmas Wherry fills that bill and then some...and she turned out to be one very fine-looking wherry. Thought you might like to see the latest Christmas Wherry to emerge from our shop here at Ducktrap. Like the Stars 'n Stripes boat, she's Okoume planked, but her finish is Bristol Beige inboard and out with bright African Mahogany trim. She is a 15-footer that was delivered Thanksgiving time, at home now in Rhode Island. 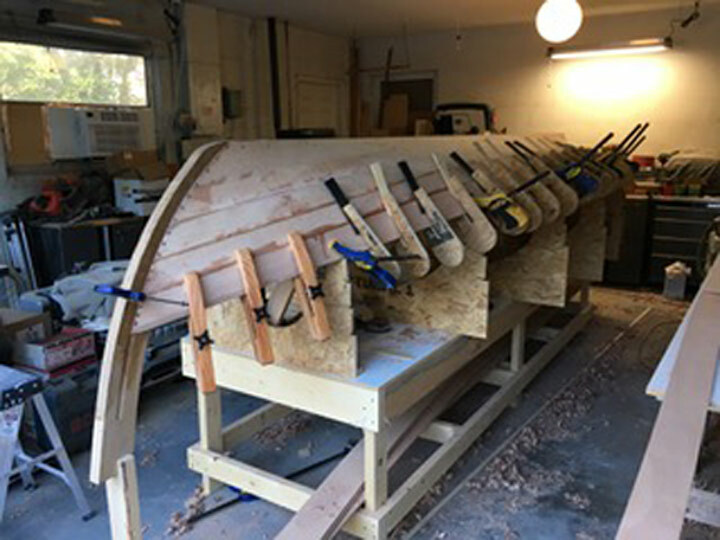 The photo at the top of the page is Paul Barnes at the helm of his Christmas Wherry, Annie Bee, that he built using a kit produced by Jordan Boats in the UK. His wherry measures 15' between fore and aft perpendiculars, has a moulded beam of 5', and a depth amidships of 1'-6", and with her 9mm Okoume planking weighs about 175 pounds. She has a plank keel that is straight in profile and 12" wide outboard at the 'midship station. Her overall profile mimics the Duck Trap Wherry, but she's deeper and broader of beam. Her deadrise is quite similar though she has a harder bilge. The transom exhibits the lovely wherry tuck and tumblehome that you've come to expect of our boats. The Christmas Wherry also has a lovely deep sheer, which is readily apparent in her builder's model–that's a picture of it below. The Christmas Wherry carries a 102 square foot lugsail. This is the traditional rudder, though the plan shows a highly efficient kickup rudder. The modification is explained on the disk. Rigging details are all shown on her sail plan, of course, and fully detailed in Buildingthe Christmas Wherry. Plans consist of 4 pages and include lines and offsets construction plans and sail plan. They are printed on 24# blueline paper and are shipped rolled unless otherwise requested. 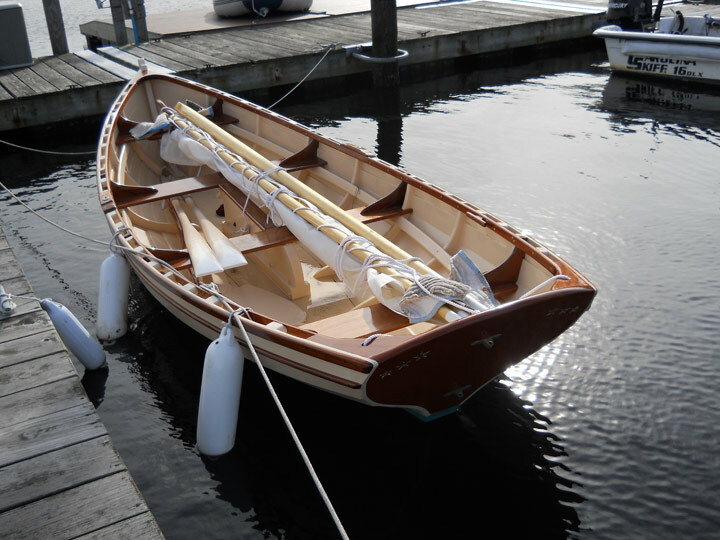 Christmas Wherry kits are also produced by Hewes & Co here in Maine. And here is a shot of one of those kits shared by Scott Williams when he was deeply involved in planking his wherry.